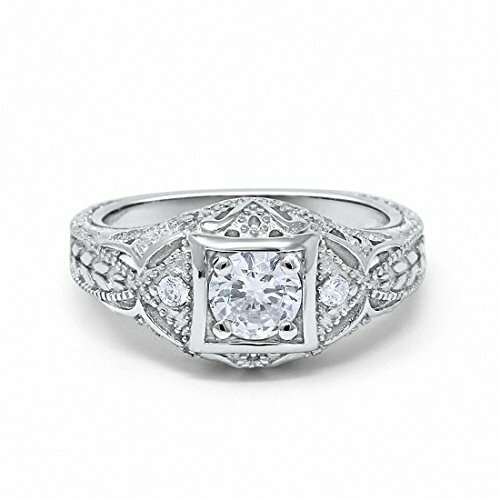 Art Deco Antique Style Wedding Engagement Ring Simulated Round Cubic Zirconia 925 Sterling Silver,Size-10 by Blue Apple Co. at Style Hoster. Hurry! Limited time offer. Offer valid only while supplies last. Item Specifications: Metal Type: Sterling Silver. Metal Stamp or Hallmark: .925 Metal Purity: 92.5% Sterling. Gemstone Creation Method: Simulated. If you have any questions about this product by Blue Apple Co., contact us by completing and submitting the form below. If you are looking for a specif part number, please include it with your message.